Elder Law Client Strategies in California presents up-close-and-personal accounts of attorneys protecting their elder clients from financial abuse, as well as proven strategies to assist them through evolutions in the estate planning process. Elder law clients tend to be more vulnerable than many others, making their protection an area of high importance. This is especially true in California, where the law explicitly requires giving them and their advisors the best tools for combating potential abuses. This Aspatore title is written by leading authorities in their respective fields who use real examples from their practices to help clients retain control of their estates and select appropriate trustees. They also outline changes in abuse regulation enforcement. Throughout each chapter, these authors provide you with specific advice on educating clients about their planning options, avoiding probate, and selecting long-term care facilities. This book contains the top tools and strategies for helping you ensure that your clients maintain control of their assets, in addition to giving you best practices for detecting and preventing potential financial abuse when you see it. 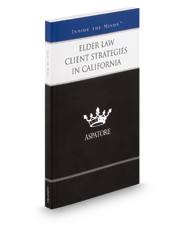 When it comes to practicing elder law in California, the experts authors of Elder Law Client Strategies in California offer invaluable insight and guidance.